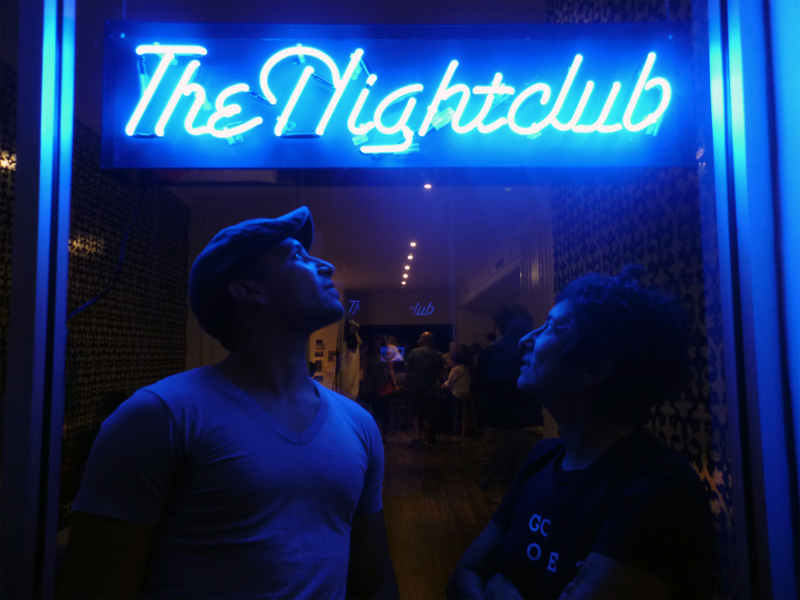 CALL TIME: 7PM was the third of twelve events produced by the collaborative curatorial project The Night Club, a series of one-night exhibition platforms conceptualized by Odalis Valdivieso and Angela Valella in different spaces within Miami’s Design District. Individually curated by invitation, this iteration of The Night Club was organized by Miami-based artist A.G. Viva. Embodying the character of a green room, CALL TIME: 7PM existed on multiple levels as a participatory artwork, temporary exhibition, and legitimate space of preparation for a photographic shoot by lifestyle publication Cultured Magazine. The glossy quarterly highlighting crossovers in art, architecture, fashion and design occupied the other side of a black curtain bisecting the gallery space, behind which crewmembers busied themselves with light meters and screens. Summer 2012 issue, Cultured Magazine. Yet all of this was secondary and actually undisclosed to the public. The preparations taking place ”back stage” of the shoot, in front of the curtain, functioned as a porous situation engaging visitors in the focused, deliberate actions of the four Miami-based artists, each preparing for their own portrait with Cultured. The dressing areas of Jillian Mayer, David Rohn, Antonia Wright, and A.G. Viva extended along the walls and corners of the front (open) space, each artist carrying out their specific pre-shoot preparations and pre-performance rituals. Though coming from distinct practices, the artists agreed to participate in the project to the extent of deciding how to portray themselves for the magazine’s portrait. Rohn, a noteworthy performance artist, enacted various drag ensembles, mixing with guests with the casual intimacy of a celebrity who opened the door of her dressing room to a group of friends. Mayer, an artist increasingly noted for her work engaging with the internet and performative structures, worked intently with wardrobe and makeup assistants to execute a kind of “body-switch”. A painted face and wig, amongst other props, altered her form so it appeared, when balancing against a wall upside down, to be upright. Wright, collaborating with artist Ruben Millares, engaged visitors to her dressing area with an invitation to paint their closed eyelids with open ones – approximating the sitter’s authentic eye color. Those who partook to the blind application of makeup were mothered tenderly and offered champagne. 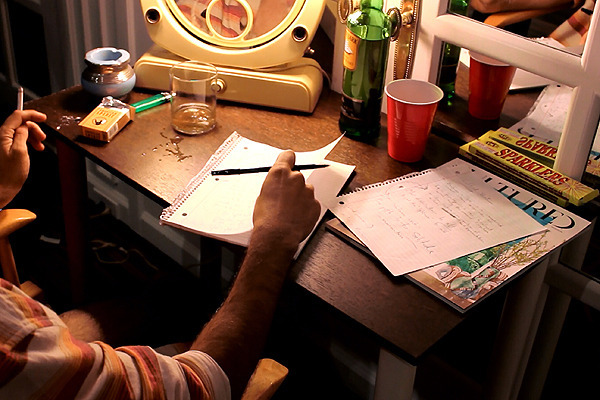 Situation documentation: The Nightclub, Open Call: 7pm, A.G. Viva at his dressing table; Courtesy The Nightclub. Viva, vulnerable and only in shorts, pulled comfort levers of indulgent luxury that many performers rely upon to relax and prepare: a fresh pack of American Spirits, a bottle of Cutty Sark, a ceramic ash tray – the kind where a small gesture lifting the central mechanism whisks the cigarette out of sight. The ensemble was reflected in the glowing bulbs of a vintage make-up mirror, and the lush, waxy fronds of a potted palm as he smoked and scribbled notes on sheets of loose leaf. Both receptive to interactions but clearly pensive, Viva’s meditative state begged the questions: Who are we right before we perform? What changes when we “go on”? When are we actually performing? Though absorbing the social fluidity of any typical art opening, the event was interlaced with moments of tension as to what truly was “happening” at any given moment, where reality became dislodged from the performative and both artists and viewers became implicated in instances of inauthenticity. Pre-theatrical adrenaline comingled with live interaction as performance, façade, and relational experience merged and then shifted to another reality behind the curtain.